A member of Northwestern's faculty since 2000, Dr. Holm teaches a wide variety of choral, vocal and music history courses in addition to directing choral ensembles. He also conducts the Sioux County Oratorio Chorus. 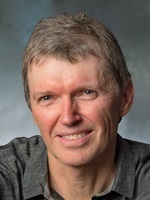 Holm was on sabbatical for the 2016–17 academic year teaching courses at a university in Taiwan, as well as directing various choral and instrumental ensembles and offering workshops and master classes in choral methods and conducting techniques. He also studied the choral techniques of Taiwanese musicians. Prior to coming to Northwestern College, he served as director of choirs at The King’s University College in Edmonton, Alberta, and as chair of the fine arts department and music professor at Prairie Bible College in Three Hills, Alberta, Canada. Dr. Holm is the recipient of two Canada Council choral conducting grants, as well as the two-year Sir Frederick Haultain Fellowship awarded by the Province of Alberta for outstanding academic scholarship in the arts. Membership in each ensemble is by auditions held in the fall during the first week of classes. Note: Ensembles may be repeated. Chamber Ensembles may be taken in lieu of private instruction for one semester in either the junior or senior year to meet scholarship requirements.